I’ve been playing around with isometric maps, since I haven’t drawn any since I tackled Mapvember towards the end of last year. I’ve always felt that my isometric maps were a little plain and boring – I’m still not confident/skilled enough to tackle some of the amazing detail work that other people working in isometric do. I haven’t seen many attempts at making a more Dyson-esque style of hatching work with isometric, though, so I thought I’d give it a go. I’m actually fairly happy with the result. 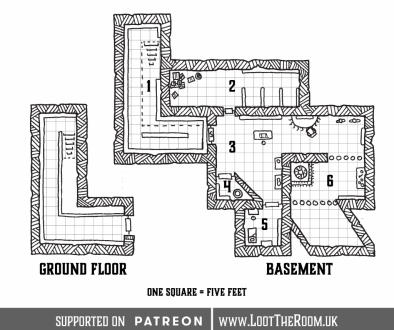 The map could still do with more detail in the rooms themselves – or any detail, really – and there are a few rough spots due to me being out of practice working in this format, but I’m pleased with how this shading looks. Next time I’m going to try combined this with more traditional overhead floorplans or cutaway sections for the tunnels and rooms beneath other sections of the map; I think that could yield some nice results, along with producing something a little more usable in play than this currently is. Let me know what you think – I’d love to hear your feedback, either here or on Twitter. The Keepers of the Holy Relics, in the northern desert city of Al Khuth, are tasked with protecting and preserving the ancient ruins that are peppered throughout the vast sands. From time to time, southern adventurers unaware of the customs of the desert peoples take it upon themselves to enter these tombs and reliquaries, triggering ancient defenses that turn the sites to rubble and looting any and all treasure they can find. When they’re caught – and they’re always caught – the Keepers come down on them hard. Should they survive the encounter with the strange magics wielded by the Keepers, these raiders will inevitably find themselves brought to the Sala Pasa – the Raider’s Ruin, or the Raider’s Destiny (there is an ongoing academic debate about the exact translation of the name, and a paralel philosophical debate about whether ruin and destiny may hold the same meaning in the barren northern steppe) to face m’hakmeh te ml – Trial By Deed. 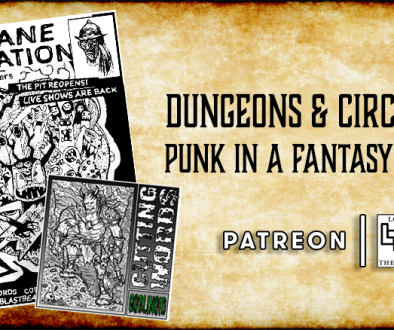 Should the hapless ‘adventurers’ survive the long fall down the Pasa’s central pit, they will have to contend with the small custom-built complex that serves as both a literal dungeon and a final test for would-be heroes – a gauntlet that they will find no respite from, and be hard-pressed to survive. Though the floor-plan has been discovered, the exact contents of the Sala Pasa are known only to the Keepers and those foolish enough to end up inside it.